Celebrating 20 years as Silicon Valley’s expert dog trainer and behaviorist! 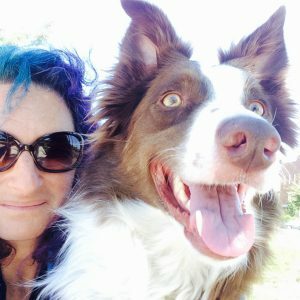 Stacy Braslau-Schneck is dedicated to helping pet dog owners solve their behavior problems and “love their well-trained dogs”through her unique combination of experience, education, knowledge, and skills! Stacy pursued her lifelong interest in animal behavior through a Master’s degree at a research laboratory, Kewalo Basin Marine Mammal Lab (KBMML, now called The Dolphin Institute) in Hawaii, studying dolphin cognition and intelligence. At the lab, she learned to train dolphins for research and exercise, using the same modern techniques that are now used with pet dogs. She designed and ran a research project investigating how creative dolphins could be and how they coordinate their movements with each other. 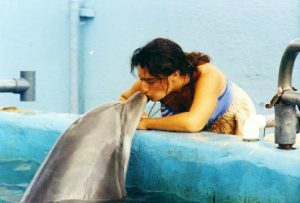 As a staff member at the lab, one of her duties was to teach dolphin training to new volunteers and students. When she returned to her native California she began transferring her animal-training and student-teaching skills to teaching pet owners how to train their dogs. She was asked to help develop and teach the first clicker training classes at the San Francisco SPCA, before moving to San Jose. She is a professional member of the Association of Professional Dog Trainers (APDT), an organization that encourages the exchange of ideas and continuing education of pet dog trainers. 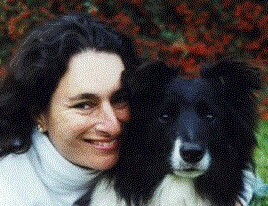 In 2001, she was awarded Member of the Year, and in 2002 she earned a Level 1 Certified Professional Dog Trainer-Knowledge Assessed (CPDT-KA) and Certified Behavior Consultant Canine-Knowledge Assessed (CBCC-KA), the advanced certification for dog trainers who offer canine behavior modification, through the Certification Council for Professional Dog Trainers (CCPDT), the first national certification for dog trainers in history. Both of these certifications require continuing education to maintain them; this means that a person certified through these programs is continual learning about the latest developments and understandings, and not just repeating “old wives’ tales” and the same unrefined training methods year after year. Over the years she has attended the Marin Humane Society Dog Trainers Academy and Dogs Of Course’s Advanced Instructor Training Course. She has been continuing her education ever since, including completing Susan Friedman’s LLA Course, attending several Canine Science Symposium events, and attending multiple conferences with the Association of Professional Dog Trainers and ClickerExpo. In January 2005, Stacy achieved Kay Lawrence’s “Competency Assessment Programme” (CAP) test at the second level “with distinction”. CAP tests the trainer, not the dog. The trainer must demonstrate her decision-making prowess, and her ability to communicate with the dog, use a target, shape, fade lures and targets, use hand signals or verbal commands, capture and shape new behaviors. Stacy was among the first in the USA to attain CAP certification. In 2006 Stacy was asked to become a member of the Board of Directors as well as a presenter for KADIE (Kids and Dogs Interactive Education), to help develop and promote an educational program to reduce dog bites to children. In 2015 she was recruited by DogBiz to teach the Dog Walking Academy in Silicon Valley. Stacy’s writing on dog training and animal behavior has appeared in several publications, from the Association of Pet Dog Trainer’s Chronicle of the Dog and The Clicker Journal, to local club newsletters like the Prairielands Bloodhound Club “Puppy Issue”, the Arizona Pointing Dog Club, and the Los Vast, Nederlandse Vereniging voor Insturcteurs in Honden (the Dutch Dog Training Club). References to her writing are found in several books, including Peggy Tillman’s Clicking With Your Dog, and she has a chapter in The Dog Trainer’s Resource published in 2006. Most recently she has published training articles in Bay Woof on training “come”, stopping jumping, barking at skateboards, and more. She is an instructor for several Telecourses (telephone conference-call seminars) for Raising Canine, an international resource for dog-training and teaching seminars. Even though Wag’N’Train is a one-person operation, Stacy won “best Private Trainer” in the South Bay in Bay Woof’s “Beast of the Bay” competition. Stacy has worked closely with the Humane Society Silicon Valley, socializing dogs awaiting adoption, teaching staff and volunteer socializers, and fostering puppies and “issue-challenged” dogs. She has lived with Shelties, a herding-dog mix, and an “All-American” (mutt), as well as rats, hamsters, and numerous fish, and of course she worked with four great bottlenosed dolphins. She shared 14 great years with Flipper, a black-and-white Border Collie mix adopted from the Humane Society in September 1999, and currently lives with Fletcher, a red Border Collie adopted at a year of age, from Marin Humane Society, with a “laundry list of behavior problems”, including dog aggression, resource guarding, handling issues, counter-surfing, and more. Fletcher has overcome enough of his issues that they are training in Nose Work (earning his ORT and NW1 so far) and Agility, and he shares his yard with the family’s two chickens. Stacy lives with with her husband and a daughter born in 2003, giving her a better understanding of the issues faced by families with young children! Stacy is dedicated to using methods that are humane and effective. She subscribes to the “LIMA” training philosophy, which means she has a commitment to use the “Least Invasive, Minimally Aversive” methods and techniques that will be effective for each client. All dogs and their situations are different, but all dogs follow the laws of learning, and Stacy is dedicated to using positive reinforcement techniques. Stacy says, “You can do anything to me that I might suggest doing to your dog – except feed me liver treats”!